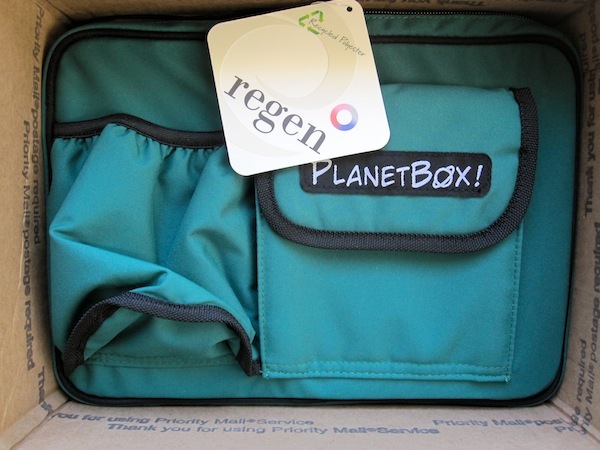 I received this PlanetBox free of charge to use and review. Thanks to PlanetBox for their generosity. Prior to the start of the school year, one of my concerns as a Mom revolved around packing my son a nutritious and healthy lunch every day. I was also looking for a lunch box that had multiple compartments in which to separate food. Using food storage containers that are made from safe materials is another concern of ours, and is an area around which my husband has spent countless hours researching. One day he emailed me a link to something called PlanetBox, and I am glad he did! It’s made of stainless steel, it’s a perfect size, and my son finds it easy to open and close, yet it stays securely latched while in its bag. This lunch box is also very easy to clean by hand, and it’s dishwasher safe. 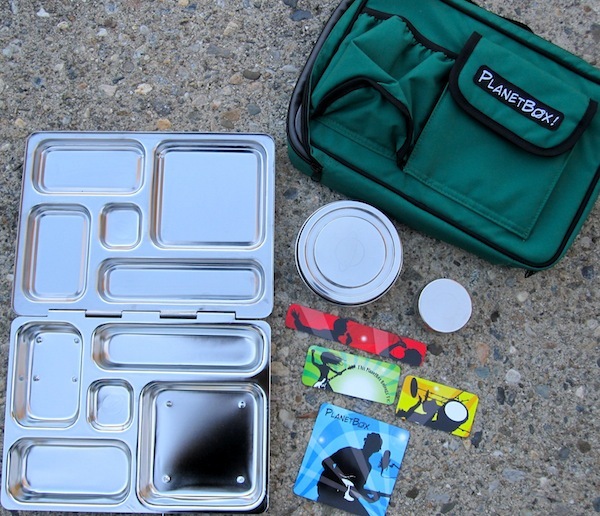 The best thing about the PlanetBox is that all those compartments allow me to be more creative packing lunches. 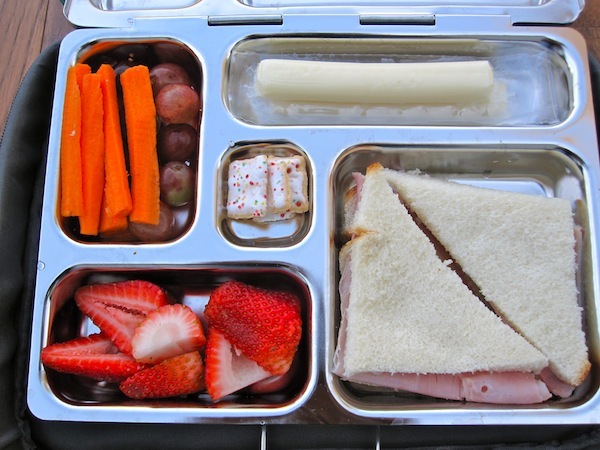 I find that it’s easier to make my son’s lunches healthier, more colorful, and a lot more fun! 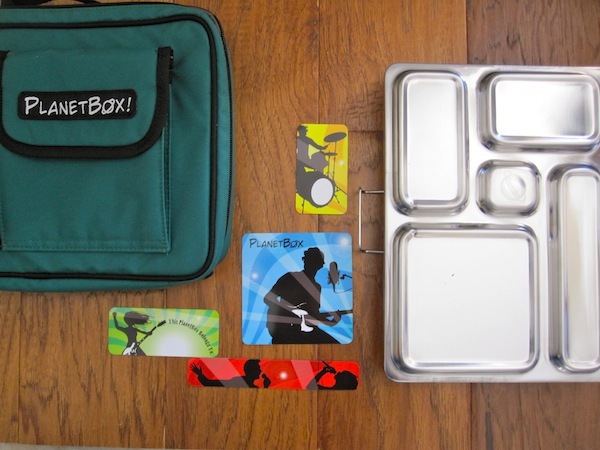 The PlanetBox Complete comes with two extra containers as well, which are great for messy foods that may leak, as these containers have seals. I definitely recommend getting the carry bag too. It is made from “100% recycled fibers”, according to the company, has a water bottle pouch on the outside of the bag, and comes in a choice of colors. There are also magnet sets from which to chose. That’s right, magnets! Your child can choose from a variety of different magnet themes that adhere to the outside of the lunch box. They’re very cute and fit the box perfectly! 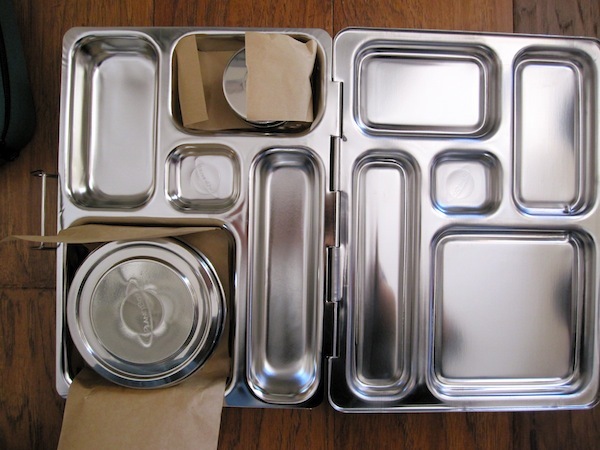 If you ask my husband, he’ll tell you the best part about the PlanetBox is that it is made of stainless steel, which from his research, is one of the safer food storage materials. We are getting away from using plastics of any kind for cooking and food serving and storage. Even the so called “safe plastics” may not be very safe. So, everyone in our household loves the PlanetBox, and for different reasons. This is the coolest lunch box around! If you want to learn more about PlanetBox, you can visit their website. Para las madres, siempre ha sido un problema encontrar una lonchera adecuada para los niños. Las madres buscan una lonchera que tenga: El suficiente espacio para los alimentos necesarios y nutritivos de un dia de colegio. Tambien quieren una lonchera que tenga un uso practico y sea facil de limpiar. Todo esto lo puede encontrar en planetBox. Para los niños es divertido, sus calcomanias adhesivas estimulan su creatividad por que pueden cambiar el diseño del PlanetBox todos los dias… Lo recomiendo…ES PRACTICO Y DIVERTIDO.